This 17th floor stunning condo faces Chase Field and features new hard wood flooring, stainless appliances as well as a full size washer and dryer to convey. This is one of the most rare and sought after floor plans Summit has to offer! One bedroom with separate den as well as additional half guest bath.Summit at Copper Square offers the best of amenities and residents enjoy a rooftop lounge, gas grills, fire pit, clubhouse, conference room, fully equipped fitness center, pool, spa and locker rooms with saunas. 24 hour staff onsite, and walking distance to everything downtown has to offer. 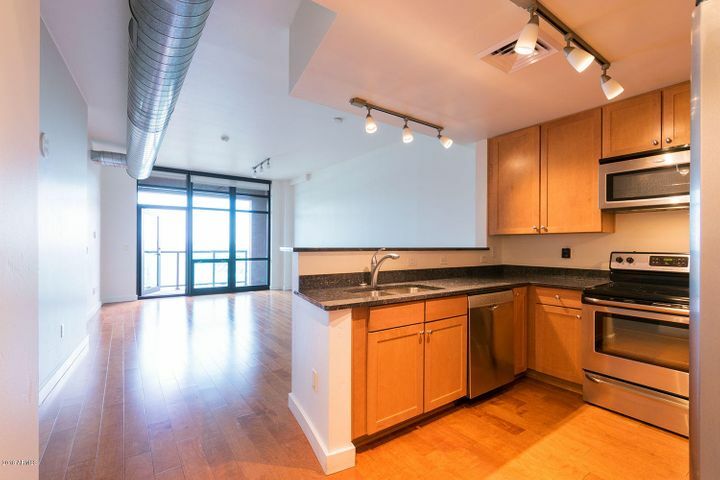 This unit also includes a garage parking space and an indoor storage locker!MUST SEE! © 2019 Arizona Regional Multiple Listing Service, Inc. All rights reserved. The data relating to real estate for sale on this website comes in part from the Arizona Regional Multiple Listing Service. Real estate listings held by brokerage firms other than Phoenix Urban Spaces, LLC are marked with the Arizona Regional Multiple Listing Service logo and detailed information about them includes the name of the listing brokers. All information should be verified by the recipient and none is guaranteed as accurate by ARMLS. All properties are subject to prior sale, change or withdrawal. Neither listing broker(s) nor Phoenix Urban Spaces, LLC shall be responsible for any typographical errors, misinformation, misprints and shall be held totally harmless. Listing courtesy of HomeSmart. Listing data last updated Thursday, April 25th, 2019 11:04:27 PM.